Joanne Calderwood hails from Scotland in the United Kingdom and is a mixed martial artist in the Ultimate Fighting Championship. On July 31 2017, she was ranked number 10 in the official UFC Strawweight rankings. Her UFC record contains five wins by KO, and three first-round finishes. Who is Joanne Calderwood, how old is she, when is her birthday, how tall is she, where is she from and what is her background? Joanne Calderwood is a UFC MMA fighter who has been training in Muay Thai since she was 13 years old. She was born in Irvine, Scotland, and now lives in Kilmarnock. Calderwood is 31-years-old, born on December 23 1986. She is 1.83 metres tall. Joanne Calderwood attended swimming lessons from a young age, and only attended a Muay Thai class to accompany her brother after his friend couldn’t make it. She enjoyed it so much that she gave up her swimming lessons in favour of training, taking two classes a day as well as training on her own. Prior to fighting, she worked as a nursing assistant, before taking a job in a gym to allow her more time to train. Why is Joanne Calderwood famous and what is her occupation? Calderwood is famous for being Scotland’s first professional female mixed martial artist. She began her career in Muay Thai, fighting in the discipline between 2000-2012. She was signed by the UFC on 11 December 2013 and has competed in various UFC fights ever since. She is a World, European and British champion in Muay Thai and holds a blue belt in Brazilian Jiu-Jitsu. What is Joanne Calderwood’s net worth? The net worth website Net Worth Tomb estimated Calderwood’s net worth at $168,000 in 2015. The Know Net Worth site estimates it to be $300,000 although it isn’t stated when this estimate was made. How much does Joanne Calderwood earn? Net Worth Tomb estimates Joanne Calderwood’s 2015 earnings to be $48,000. After missing out on a fight bonus in 2016, Calderwood posted an image on her Instagram of her wearing a cap bearing the words ‘broke as hell’. How much does Joanne Calderwood weigh? Calderwood reportedly weighs 114.64 pounds, or 52kg, placing her at the top end of the UFC strawweight category. Who has Joanne Calderwood fought in boxing matches, how many fights has she won, what are her most famous fights? Joanne Calderwood’s competitors in kickboxing include Sally McCarthy, Melissa Ray and Kirsty Mack. Her MMA opponents include Seohee Ham, Cortney Casey and Maryna Moroz. Of her 21 kickboxing matches, she has won 19. In MMA she has won 11 of 14 fights. Her TKO win against Valérie Létourneau made UFC history as the competition’s first women’s flyweight bout. 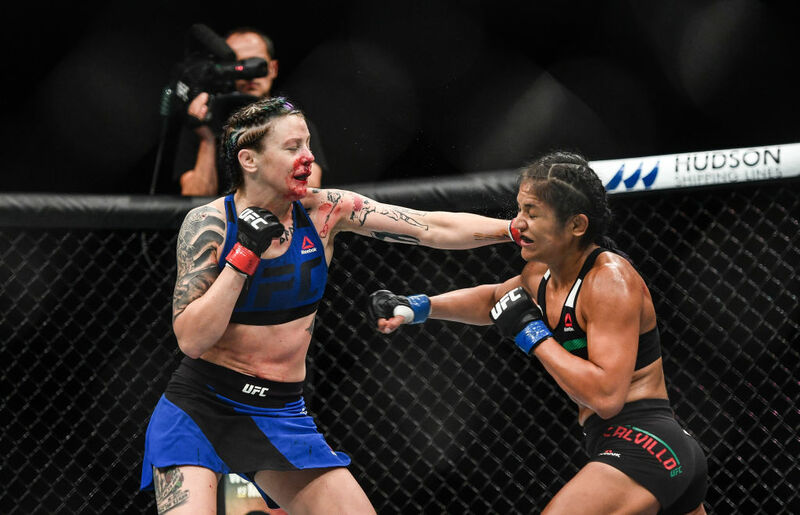 Calderwood faced Cynthia Calvillo on July 16 2017. Upon weighing in, Calderwood was found to be 118 pounds, two pounds over the strawweight limit of 116 pounds and was fined 20% of her fight purse. Cynthia Calvillo took the victory in the bout. What nationality is Joanne Calderwood? Who is Joanne Calderwood fighting next, when is her next fight, where is she fighting next? Calderwood recently pulled out of a scheduled fight due to injury; in light of this, she has no further fights scheduled at this time. Where does Joanne Calderwood train, who is her trainer? The UFC fighter trains at Tristar Gym. Her head trainer is James Doolan. What happened to Joanne Calderwood, has she retired? Calderwood has not retired; she was due to fight Bec Rawlings on November 19 2017. She announced on November 9 2017 that she was pulling out of the fight due to an undisclosed injury. Ooh woo, I'm a rebel just for kicks ? Does Joanne Calderwood have any children? She doesn’t have any children. Is Joanne Calderwood married, who has she dated in the past? Calderwood is unmarried. She dated her former head coach for around seven years, splitting up around 2015. Due to the relationship ending, they were unable to work together and they ended their professional relationship soon after. There is little officially known about Calderwood’s current relationship status, although in October 2017, Calderwood posted an image to her official Instagram of her and an unnamed man. The photo showed the couple relaxing together and was captioned ‘couples who clash of clans together stay together’.